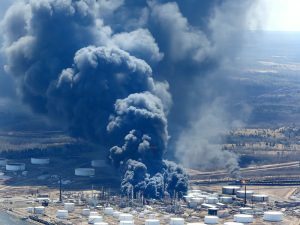 Following last April’s Husky Energy oil refinery explosion, fire, and resulting evacuations, it took a year for Husky to officially declare its intention to continue the use of hydrogen fluoride (HF) at its Superior, Wis. operations. In its Apr. 3rd announcement, the Canadian company said it would keep using the deadly chemical and upgrade some safety features. HF is a contact poison capable of causing blindness, cardiac arrest and even death from fluid buildup in the lungs. Swallowing only a bit may be fatal. HF burns through skin, eyes, lungs and the GI tract, and seeks the bones. HF even interferes with nerve function, so symptoms of exposure may not be immediate, and HF burns may not initially be painful. The April 26, 2018 explosion “was felt for miles” according to the Mpls StarTribune. 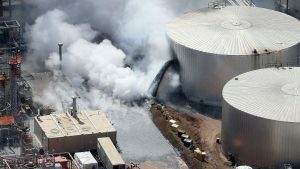 The blast was so violent that shrapnel from the explosion was blown 200 feet, according to an August 2, 2018 Factual Update by the US Chemical Safety and Hazard Investigation Board, “puncturing the side of [a] steel tank and spilling over 15,000 barrels of hot asphalt into the refinery.” How much “over 15,000” the update didn’t say. This liquid asphalt caught fire around 12:15 p.m. and burned for nine hours. 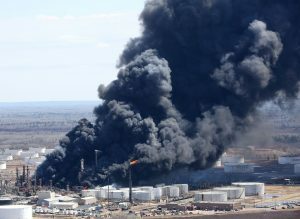 An evacuation order covering a 3-mile radius around the refinery, and a 10-mile down wind rectangle to the south, was imposed to get people away from the fire’s plume of toxic smoke and from a possible leak of the HF. Luckily, no HF was dispersed by the explosion and fire, and the evacuation order was lifted at 6 a.m. the next day. The evacuation order extended for a 3-mile radius around the refinery and a 10-mile rectangle downwind. To extinguish the asphalt blaze, fire retardant containing dangerous compounds was used in large quantities. Consequently, “Water has shown trace amounts of perfluoralkyl sulfonate, a chemical found in firefighting foam…,” the Duluth News Tribune reported on May 7, 2018. Exactly what water, the paper didn’t say. Was it in St. Louis Bay, firefighting runoff, the sewer system, nearby Newton Creek, all of the above? Last October, the Occupational Safety and Health Administration cited Superior Refining Company LLC for eight serious violations of OSHA’s process safety management procedures including failing to control the use and release of highly hazardous chemicals. The company was fined $83,150. The fine adds to a long record of bad faith by the refinery: in 2008, then owner Murphy Oil paid a $179,000 fine for safety violations including the switching off of hazard alarms; in 2015 new owners Calumet was fined $16,500 for breaking rules regarding flammable liquids, hazardous waste and emergency response. Not much attention has been paid to PFAS since it was found in the water. The focus of EPA, OSHA, the Chemical Safety and Hazard Investigation Board, and the cities of Superior and Duluth has been Husky’s hydrogen fluoride danger. On May 1 last year, Superior Mayor Jim Paine and Duluth Mayor Emily Larson both called on Husky Energy to stop using the HF. US Rep. Betty McCollum, D-MN, chimed in last May 9, calling on Marathon Petroleum in St. Paul Park to stop using HF. Husky waited until this month to say it’s sticking with HF. Local activists with the group Twin Ports Action Alliance have planned several events this weekend marking the shocking event’s first anniversary. Many questions still demand answers: How many wells were tested? To what depth were the wells tested (600 feet may be clear, while 150 feet may not). Where were the testing wells? What amounts of PFAS were found? Did the equipment detect 1 ppt, or does not find less than 100 ppt? Were individual homeowners’ wells tested? Has a plume of PFAS extended from the source? How Far? What is the direction of groundwater flow? 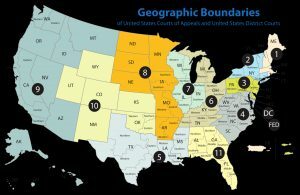 Is the municipal water supply system tested for PFAS? Was the sewer system contaminated? Is the sludge being tested for PFAS? Inquiring minds want to know. NATO’s crimes, including the desecration and mutilation of corpses, bombing of allied troops, torture of prisoners, and drone strikes on civilians, have fueled the recruitment of militants and even terrorists in Afghanistan, Pakistan, Iraq, Syria, Libya, Yemen, and Somalia. While bombing Libya in March 2011, NATO refused to aid a group of 72 migrants adrift in the Mediterranean. Only nine people on board survived. 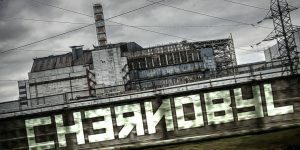 The refusal was condemned as “criminal” by the Council of Europe. In a Feb. 12, 2010 atrocity kept secret until March 13, U.S. Special Forces commandos killed a teenage girl, a pregnant mother of 10, a pregnant mother of six, a police officer and his brother, and are accused of trying to cover-up the killings by digging bullets out of the victims’ bodies, washing the wounds with alcohol and lying to superior officers. NATO jets bombed and rocketed an allied Pakistani military base for two hours Nov. 26, 2011, killing 26 Pakistani soldiers and wounding dozens more. NATO has refused to apologize. On April 12, 1999 during NATO’s Operation Allied Force, a U.S.-piloted F-15E attacked the railway bridge over the Juzna Morava River with two precision laser-guided AGM-130 missiles, both of which hit a five-car civilian passenger train that was crossing the bridge killing between 20 and 60 people. Amnesty International said the attack should have been stopped when the train was hit, and that the second bombing was a war crime. On April 23, 1999, again during the unlawful war on Yugoslavia, NATO bombed the headquarters of Radio Televisija Srbije, the state-owned broadcasting system in Belgrade, destroying the building. Sixteen civilian employees were killed and 16 wounded. Amnesty International said the NATO bombing was a war crime, and Noam Chomsky called it an act of terrorism.